Design research has a huge role to play in better understanding how our design and construction processes can more effectively address the urgency of decarbonization in the built environment. I had the opportunity to collaborate with on an interdisciplinary team on a jointly funded, long term research project with Buro Happold, involving a global effort and pilot design. Working as an integrated team, Woods Bagot and Buro Happold partnered on a targeted design research effort called ZERO e, for zero emissions design, which I had the privilege to lead. Once under way, we focused the work on a master planned urban redevelopment project at an aging steel mill site in Chongqing, China. Our research centered on key questions surrounding sustainable urban development: What would a master planned district, typical of current Chinese planning patterns, look like if all new infrastructure and each building were deliberately designed to work together as a system for a zero carbon, self sustaining, and healthy community? What tools would we need to ensure the ZERO e goals drove fundamentally drove design, from master plan to individual building systems? Our process took advantage of the Buro Happold's array of engineering expertise, from site hydrology and sustainable infrastructure design to custom modeling tools and analytics, to holistically address systems from energy and water to on-site waste processing and food production. At the building scale, each typology (workplace, residential, commercial retail, etc) was modeled with real-time performance feedback, so we could test strategies and understand their effectiveness relative to site-wide systems. 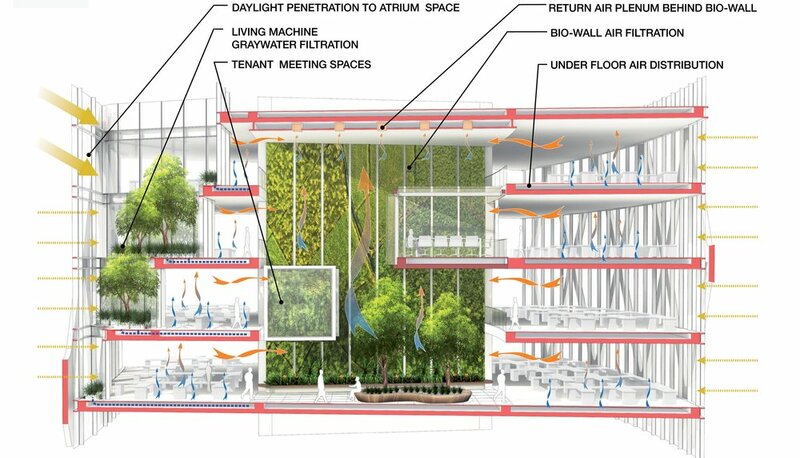 We began to see the need for ideas like living systems both as site amenities and pragmatic options in a high rise office space. Our architects and engineers worked together to refine software tools as we applied them to the design, with a focus on simplification and speed, to inform design decision making while it was happening. The work increasingly focused on design process, and a re think of how architects particularly prioritize their work. The ZERO e research effort was made public and became the basis for educational materials and conference presentations such as GreenBuild and Bloomberg BusinessWeek Summit.